…Killer of working prospects or enricher of working lives? Andy Haldane, the Bank of England’s chief economist, said automation posed a risk to almost half those employed in the UK and that a “third machine age” would hollow out the labour market, widening the gap between rich and poor. AI may well be the future – but what sort of future will that be? Some of the latest headlines cast a sombre shadow on the prospects for humanity. Even McKinsey, a calm voice of reasoned opinion, is predicting that 140 million jobs could be lost by the year 2020. That’s less than four years away! 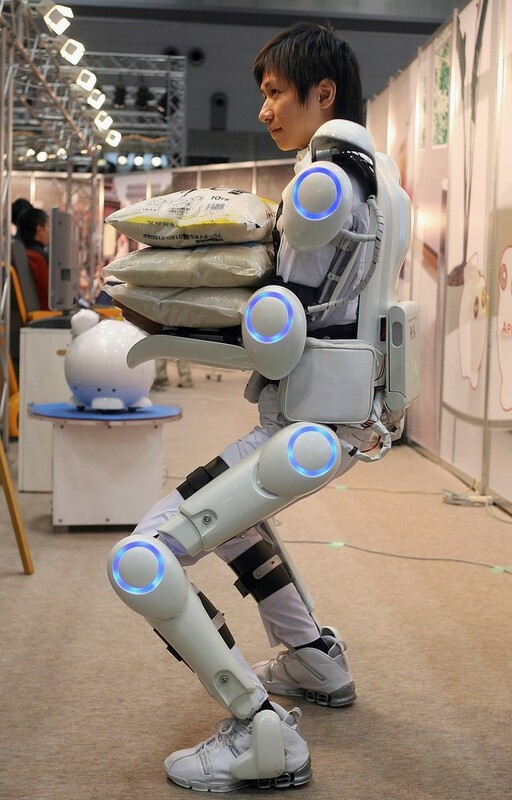 Any follower of tech-development cannot fail to be impressed by the latest generation of exoskeleton pioneers. They have literally turned ‘Ironman’ into a superhuman reality. By creating a supportive techno-carapace, they have empowered people to lift weights and sustain performances that were previously unthinkable. And if you take that same inventive thinking and wrap it around everyday processes that are struggling to deliver, you can achieve results that are equally startling. Your smart phone suddenly develops a fault, so you call the network’s helpline. After working your way through a tedious set of automated options, you eventually connect with a human – and that’s when your problems really start. Tasked with handling everything from handset queries, billing complaints and upgrade enquiries to technical faults, signal failures and contract cancellations, the well-meaning ‘customer advisor’ is overloaded and ill-equipped. In a regime that measures performance on the brevity of the call and not on the quality of the resolution, the poor advisor is also under impossible pressure. So he offloads you. Like a parcel at a children’s party, you are passed to other ‘advisors’ who diligently strip the outer layers of the problem without ever reaching the core solution. And believe me, this is not an exaggeration. Recently, I was with the senior executive of a very large mobile phone company who admitted that 37% of customers who call their help centre, call back again within 7 days! That is a failed system – a formula dedicated to customer (and employee) dissatisfaction. But there is a better way. And it’s rooted in AI. I have been working very closely with AI firms that specialise in knowledge capture. They harvest the expertise of key workers and distil it into a knowledge map. This becomes an instantly accessible reference point – ensuring that valuable experience is never lost through resignation, redundancy or retirement. But that’s just the start. These knowledge maps can be used to deliver a superior customer experience. For example, when a customer calls a contact centre, their mobile phone number can be routed through to the AI system that manages the knowledge maps. In real time, this system can – to a remarkably high degree of accuracy – calculate the likely reason for the call. It can then pre-populate an adviser’s screen with tailor-made answers – drawn from the knowledge map – to resolve the customer’s specific problems. That call triggers a chain reaction of real-time events. Your call history for the last 48 hours is instantly analysed… any historic connection failures are cross-referenced with mobile ‘dead’ zone data… your dropped calls or failed mobile apps are traced to an individual fault at a specific base station… simultaneously, this news is flashed straight to the customer adviser’s screen… intense customer dissatisfaction can then be mitigated with a personal apology, a full explanation and a modest but very welcome compensation offer. In parallel, AI technology can also be computing a host of other real-time calculations. For example, your call history might reveal a series of contacts with one specific number… the knowledge map would instantly identify this number as an independent phone retailer with a particularly aggressive sales strategy… anticipating a hostile attempt to switch you to a rival network, the AI system could immediately review all known competitor plans… it could then create a bespoke package designed to side-line and eliminate rivals whilst locking-in long term customer loyalty. All in real-time. Suspend your imagination. This is reality. Imagine it. Before your first ring tone has died away, AI could anticipate problems and arm contact centre advisers with tailor-made solutions. Now suspend your imagination. This is not a sci-fi scenario, it is fast becoming a real-time reality. I know it because I am working with the niche innovation teams that are developing these radical AI applications. First-call resolution rates will soar. What’s more, this technology is not confined to contact centres. Any touch point and interface with consumers can adopt and adapt this thinking. I would dearly like to reveal more and would be happy to field calls and emails on this fascinating subject. However, in closing, let me end where I began. The future is always uncertain but I certainly don’t fear the spectre of AI. Quite the reverse – I welcome it. For visionary companies with the confidence to embrace change, AI promises a new era of opportunity – for customers, companies and employees. So carpe diem… you have nothing to fear but fear itself.